Okay if you know me personally or follow me on twitter, you know that I love love Kerrygold cheese and butter and my favorite is their Dubliner cheese. I can eat it plain or in an omelette, on salads, whatever…I love it! I have been wanting to make a cheese sauce to go with steak so when Emily challenged me, it just pushed me to go ahead and try this. 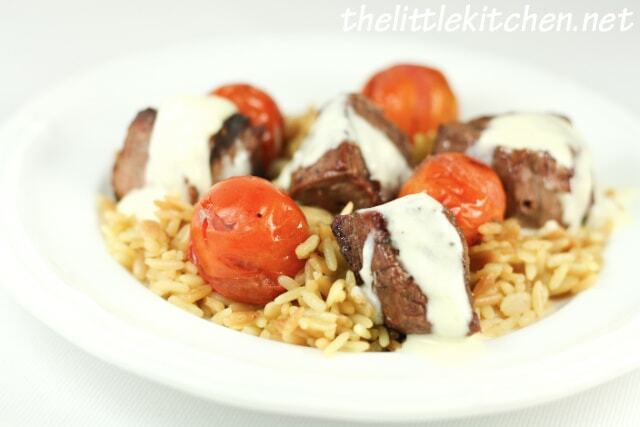 I was going to do it with whole steaks but my husband saw an ad for a restaurant that had filet pieces on skewers with tomatoes and wanted to try this. And since we’re in Florida and are very fortunate to be able to grill almost year-round, I said alright let’s do it. 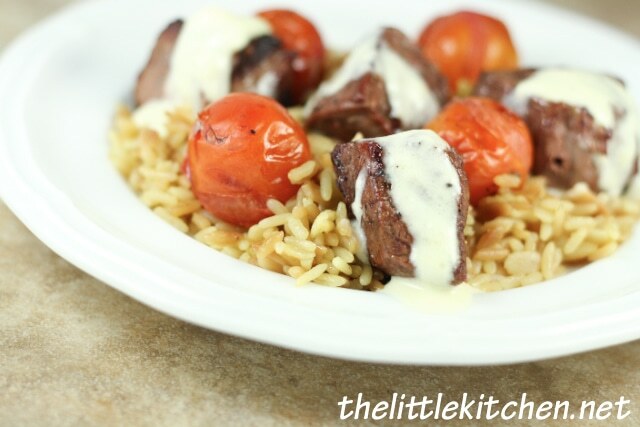 It turned out so good…I don’t have a lot of luck grilling whole tenderloin filet steaks. I usually overcook them on the grill. So cutting them into 1 1/2 to 2 inch pieces really sped up the cooking time and then add the rich Dubliner cheese sauce…divine! This meal is going to go into our regular rotation (for when we can splurge a little and get tenderloin filets, of course). Be sure to check out Emily’s post. She made Roasted Asparagus Salad and a Kerrygold Roast Chicken! The sauce is really easy to make with dubliner cheese, heavy cream, salted butter, salt and pepper. And how about a salad topped with Dubliner cheese to go with the skewers? I made a very simple salad dressing with olive oil, lemon juice, dijon mustard, salt and pepper and topped with dubliner cheese (I grated the cheese with a vegetable peeler). 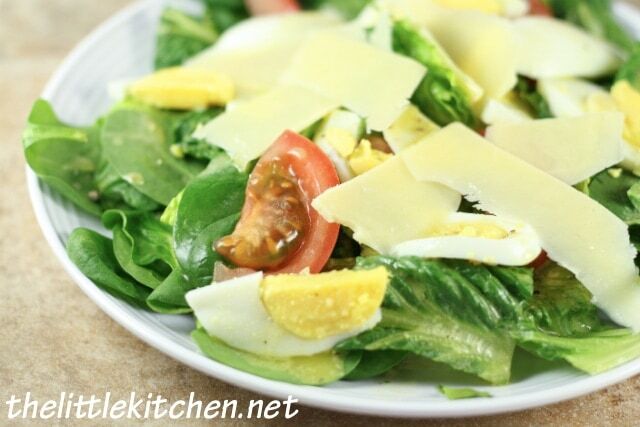 I love simple salads with just lettuce, tomato, boiled eggs and cheese. The cheese lends a little sweetness to the dressing that has lemon juice and djion mustard. 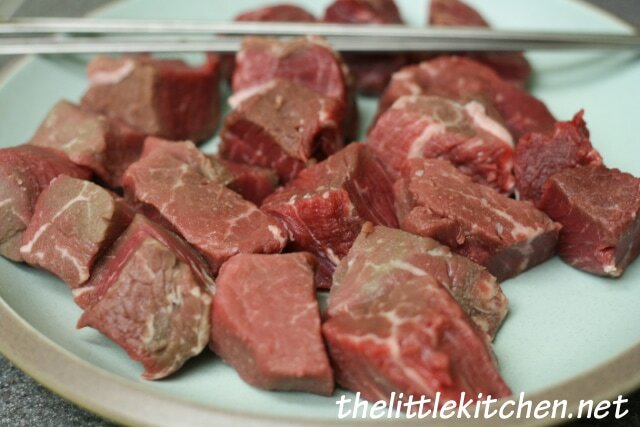 Allow the beef to sit outside of the refrigerator for about 20-30 minutes. Rinse the beef and pat dry with paper towels. Cut into 1 1/2 to 2 inch pieces. 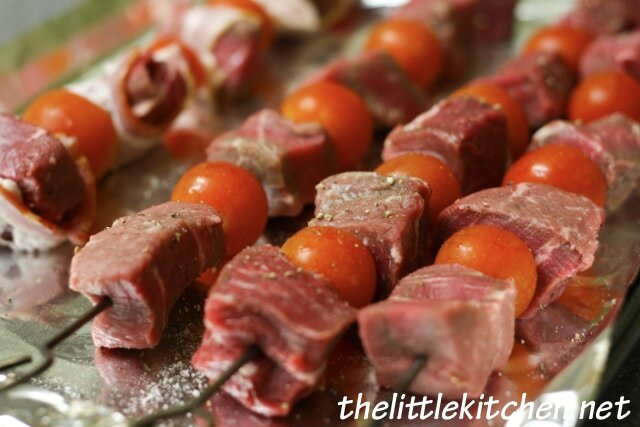 Put onto metal skewers (if wrapping with bacon, wrap them first) alternating between beef and tomatoes. Heat heavy cream and butter on low to medium heat for about 5-8 minutes. Remove from heat and add a little bit of salt. 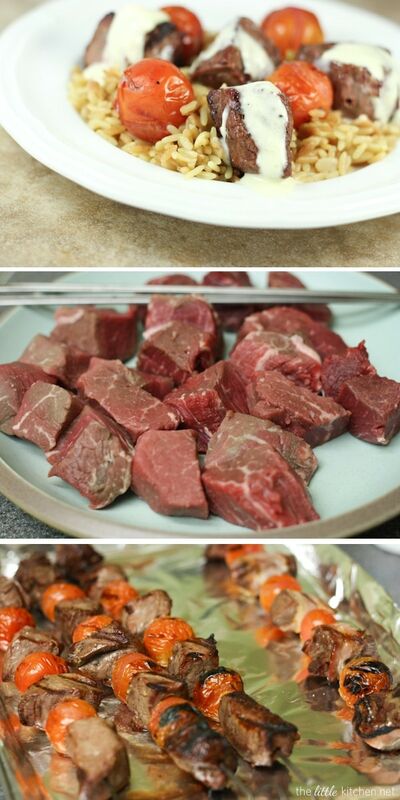 Remove from grill and allow the beef to rest under a piece of loosely tented foil for at least 5 minutes. 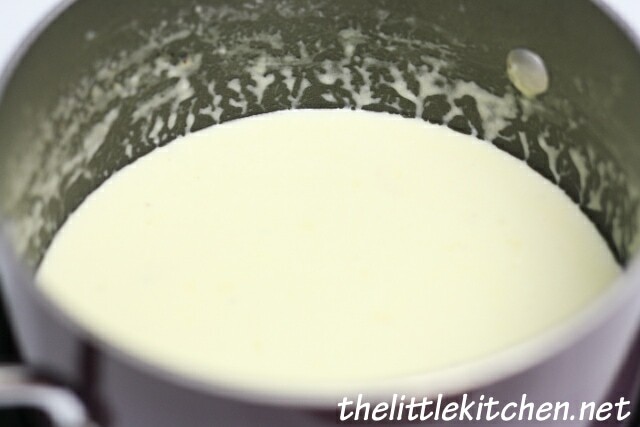 Return cream to low heat and add Dubliner cheese to the heavy cream. Stir to incorporate and allow the cheese to melt faster. When it’s completely melted, add pepper to taste and leave on warm. 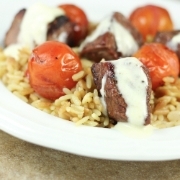 Serve beef with cheese drizzled on top over rice. Whisk olive oil, lemon juice and mustard together. Add salt and pepper to taste. Drizzle over salad and add Dubliner cheese. Seriously, this sauce is amazing. It’s not too rich and it’s sweetness and butteriness brings the tenderness of the beef to another level. It’s so good, I can’t wait to make this dish again! I did wrap some of the filet pieces in bacon at my husband’s suggestion. I don’t eat pork so those were all for him. He loved this meal too and can’t wait for me to make it again. 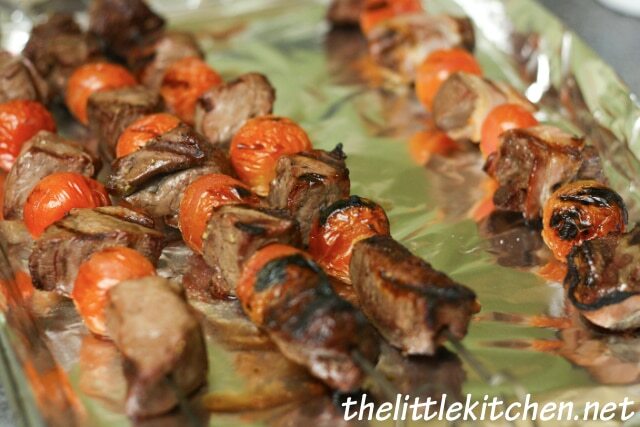 You can’t go wrong with grilled tomatoes either, you could even add this to your salad if you wanted to. Disclosure: I did win some Kerrygold cheese and have worked with them in the past. This post is not sponsored.